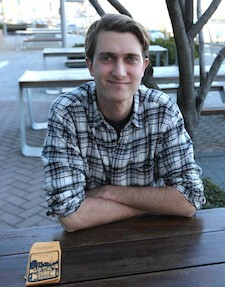 Zach Pickens, founder of Rooftop Ready Seeds. When you think of New York City, you think of an urban cement jungle of taxis and crowded people – antithetical to a peaceful world of green gardens and fresh produce. Not Zach Pickens. When he followed his wife, a theatre producer, to the Big Apple from his Ohio roots, he figured it was just the time to start his rooftop garden business: Rooftop Ready Seeds. Pickens, a political science major, wasn’t exactly trained for urban farming. When he saw an empty rooftop on his apartment building in Brooklyn, he relied on memories of his grandparents’ backyard gardens to guide his effort to ‘green’ the asphalt plot. Eventually, he was hired as the farm manager for Riverpark Farm, supplier for Riverpark restaurant, and one of the largest urban farming models in New York City (they launched their rooftop farm on the site of a stalled construction site). Pickens cultivates some 7,000 milk crate containers lined with landscape fabric, growing tomatoes, peppers, peas, herbs and other produce for the restaurant (and the same, on a smaller scale, on his own rooftop). His success allowed him to offer classes on rooftop gardening to a generation of new young professionals eager to “do something about the environment” while insuring a fresh, healthy, daily food supply. This led to Pickens’ development of gardening curricula for local public schools, like PS20 in Brooklyn. With grow space so tight, Pickens didn’t have time to waste on produce that wasn’t flourishing, so he started to save seeds from plants that were the most productive. When he replanted the next season, with rich results, he realized there was a niche market for seeds acclimated to an exact growing environment. Rooftop Ready Seeds was launched and now offers 25 seed varieties of peppers, tomatoes, herbs, greens, okra and collards. Pickens also found a surprising population of micro-gardeners thirsty for gardening knowledge. He was there to advise on best organic methods (“I’m not certified organic, but I only grow organically, with no pesticides,” he said), best traditional composting and worm composting practices (composting is a major factor at his Riverpark setup), and best seed sourcing. He works with neighborhood nurseries and plant shops. Brooklyn Grange is a rooftop farming company with two-and-a-half acres of rooftop cultivation located in Queens and Brooklyn. Pickens swaps seeds, all open pollinated, with them. Kimberly Sevilla is the owner/manager of Rose Red & Lavender, a flower, plant, seed (and “all things beautiful”) shop in Brooklyn. She met Pickens when he was a novice grower and has worked with him to develop seedstock for several years now. Both Sevilla and Pickens have said they’ve noticed growing numbers of urban farmers in their neighborhood, originally a bastion of first-generation Italian immigrants who were culturally rooted in home kitchen gardens. Like Sevilla, Pickens’ overriding ambition is to teach his community how to grow in small plots. Rooftop Ready Seeds isn’t a profitable entity yet. He is his only employee. He relies on online sales and personally delivers seed packages to three area garden shops. But he also works with Red Hook Community Farm in lower Brooklyn, an urban farm built on the site of a weed-filled, abandoned baseball park, and designed to teach urban youth how to grow urban food and stimulate local economic activity. As he sees it, he’s just helping teach the next generation of farmers to feed their communities.